We are C S Bowyer Funeral Directors in Trowbridge, and we are here to give you our uncompromising kindness and support, to help make a difficult time a little easier for you and your family. Our Wiltshire funeral directors can be traced back to 1881, when we were founded by H S Bowyer, who was renowned for his beautifully conducted funerals and impeccable memorial masonry. We understand that life with the ones you love is deeply personal, so a farewell should be no different. From choosing your favourite flowers, to the hearse you want for the procession, as your Dignity funeral directors, we will make sure everything is just as you want it. If you think an alternative type of service is fitting for your loved one, such as a green funeral, then we will be able to make all of the arrangements for you. We can also offer repatriation services, and a range of tributes, such as stationery and jewellery. You are not alone, so please give us a call and we will do everything we can to help you. Call us today on 01225 768846 to talk through your personal requirements. If you need advice on parking, please give us a call so we can help you. For help with directions, see the map or get in touch. Our staff are available 24 hours a day on 01225 768846 if you require our services outside of these hours. My brother's funeral was the second that C S Bowyer's have directed for us in the last twelve months. We have always found them to be very helpful and considerate when discussing the necessary arrangements. My family have all agreed that both funerals passed off as we had wished. We would not hesitate to recommend C S Bowyer Funeral Directors to others. Thank you for the comments left as part of your online review. I am pleased that all of the arrangements were carried out to your satisfaction. All of the staff were respectful and made themselves available. They gave helpful advice. Parking at the office can be difficult. The day of the service went beautifully and we were given all the support we could have wanted. The big challenge when arranging a funeral is comparing costs at a time when you just want to manage a difficult situation. I don't know the solution to this. Thank you for your 5* rating and comments. We are happy to hear that you were satisfied with the services of C S Bowyer and that our staff were respectful and helpful. Thank you once again for your 5* review. A very efficient service right from the start when we called them in the middle of the night. Would recommend. Thank you for the comments left as part of your online review. I am glad that all of your wishes and requirements were carried out by the team as you had requested and that we were able to provide you with the care and support needed at this time. 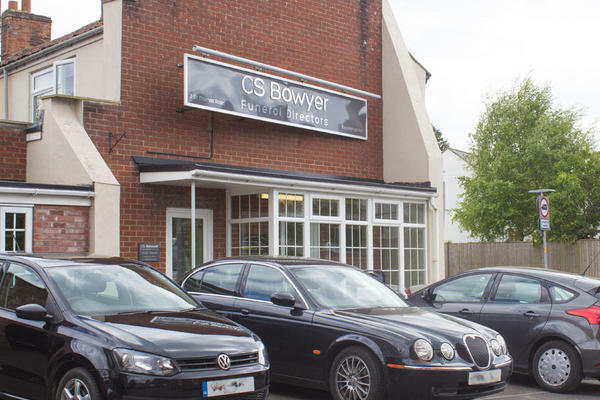 The staff at CS Bowyer were very helpful, kind, thoughtful & efficient throughout the arrangements. The funeral service was exellently arranged & all guests remarked on what a good send-off it was. The only downside was that the total cost of the funeral had increased by about 50% since my mothers funeral 6 years ago. I was very pleased with the quality of service at my mother in laws funeral everything and more was done for her and our family to ensure it was all how we wanted it to be . Thank you for taking the time to return your online review. I am pleased that we were able to provide such a high level of service at branch and that all of your requests were carried out as you has wished. Dignity Client Care Team.